Objective: To get temperature, humidity, light intensity and PM2.5 at the weather station. Read temperature, humidity, light intensity and PM2.5 data and display those data on the screen. Upload the data to Blynk. 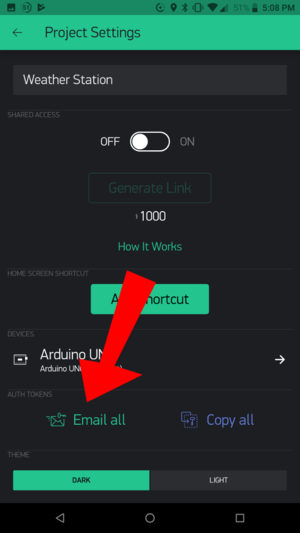 View data on phone anywhere using the Blynk app. Created by Microduino with Microduino components. Note: Different revisions may contain different components. Note: Different revisions will contain different components. 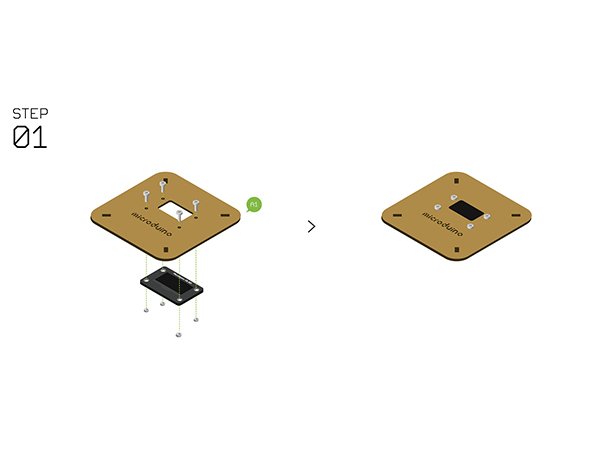 Duo-V will be replaced with a Microduino-Cube-S1. 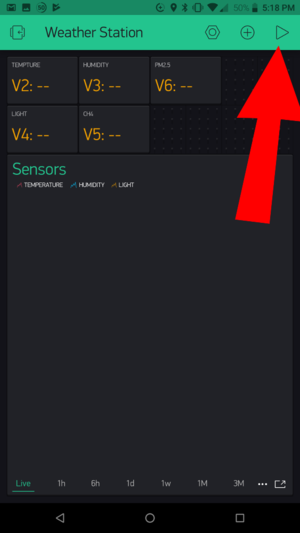 Humidity/TempSensor will be replaced with a Tem&Hum-S2. Use the Microduino-Core+ to analyze and process sensor data. Display data on the Microduino-OLED. 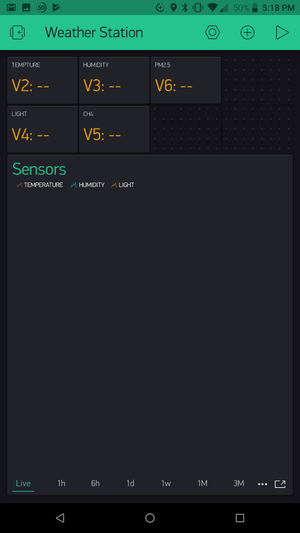 Connect the Weather Station with Blynk via Microduino-WIFI(ESP). 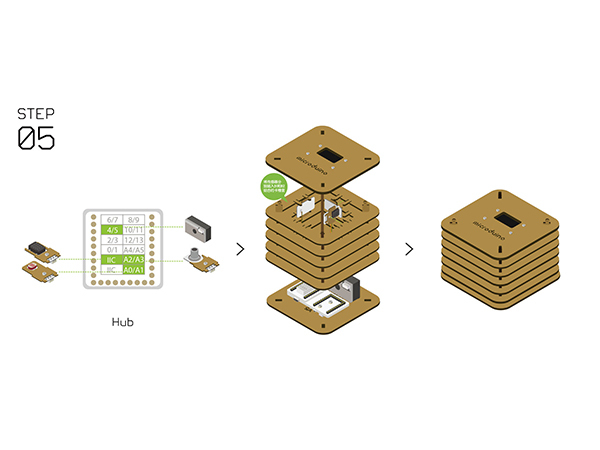 Each sensor connects with Microduino-Sensorhub. Next, we'll learn how Microduino interacts with Blynk through the configuration process of the Weather Station. Visit the Google Play Store or the Apple App Store and download the Blynk app. You'll need to setup an account with Blynk before proceeding. Please use a valid e-mail as your authentication tokens will be sent to that e-mail. On the main screen of the Blynk app. 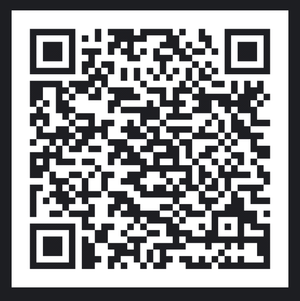 Click on the QR code scanner to scan the Weather Station app. 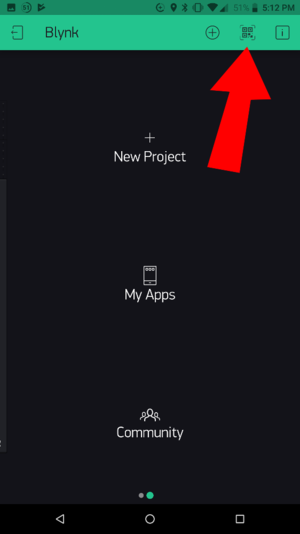 Once the project has loaded, click on Project Settings (nut icon). Under Auth Tokens, click on Email all. This will send the authentication token to your registered e-mail. Make note of this, as you will need this token later. Click back to return to the Weather Station app. Please follow the guide to ensure your software is correctly setup. The software is required to program the WiFi Weather Station. Stack Microduino-Core+ and Microduino-USBTTL together. Connect Microduino-USBTTL with a USB cable. Connect the other end to the PC being used. 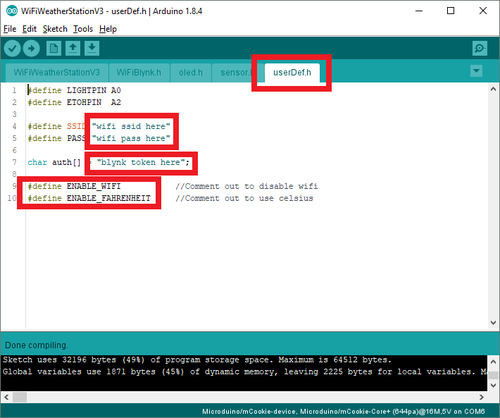 Open the Arduino IDE for Microduino development environment. (Please refer to the #Software Setup section). Tools > Port > select the port (On MacOS, NOT the Bluetooth one). Unzip the file. Under the software (Arduino IDE), go to File > Open... and navigate to the unzipped folder and open the ESP8266BlynkWeatherStationV2.ino file. auth key as noted earlier in the Blynk app sent to you via e-mail. Click on the upload button (right arrow icon on the top left) to upload the program. The program will compile and upload. Once completed a upload successful message will appear on the bottom left. Fixate Microduino-OLED and Structure-A1 with screws. Note: Different revisions of this kit may contain different components. Either a Duo-H or Cube-S1 should be used. Duo-H is illustrated. Fixate Microduino-Duo-h / Microduino-Cube-S1 on Structure-A2 with screws and nuts. Stack the following modules on Microduino-Duo-h / Microduino-Cube-S1. Attach the included adhesive strip onto the PM2.5 Sensor GP2Y1010AU0F, then to the base board. Note: Different revisions of this kit may contain different components. Either a Temp&Hum or Tem&Hum-S2 should be used. Temp&Hum is illustrated. 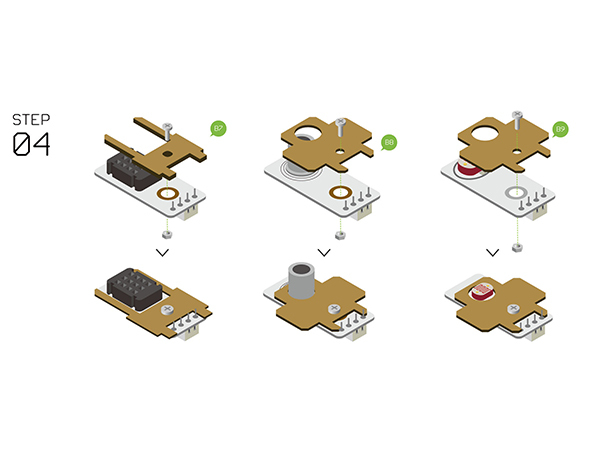 Assemble the following sensors with Structure-B7, B8, B9. 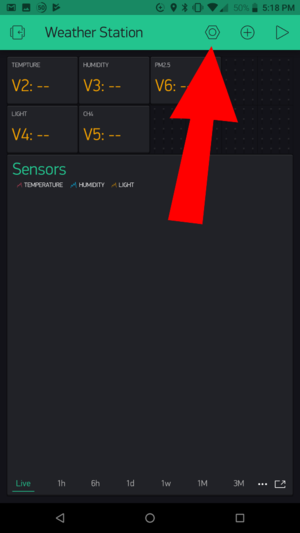 Connect the sensors below to Microduino-Sensorhub using a connector wire. Temperature and humidity sensor (Microduino-Temp&Hum / Tem&Hum-S2) to pin IIC. Air quality detector (Microduino-Air Quality) to pin A2/A3. Light sensor (Microduino-Light) to pin A0/A1. 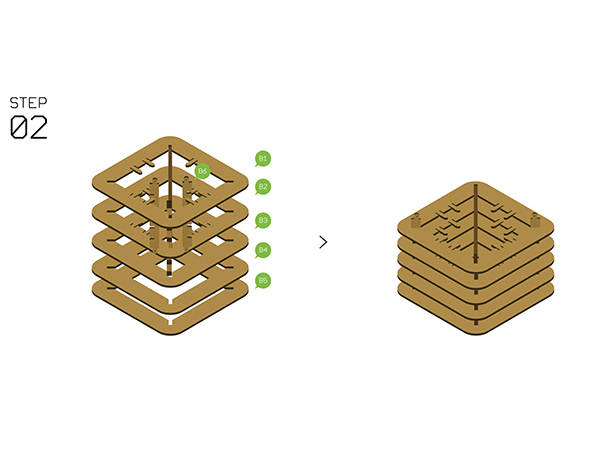 Refer to the picture below, stack all sensors on the slot of Structure-B1 and Structure-B2. After that, connect Structure-A1 and Structure-A2 at the top and bottom of the system respectively. 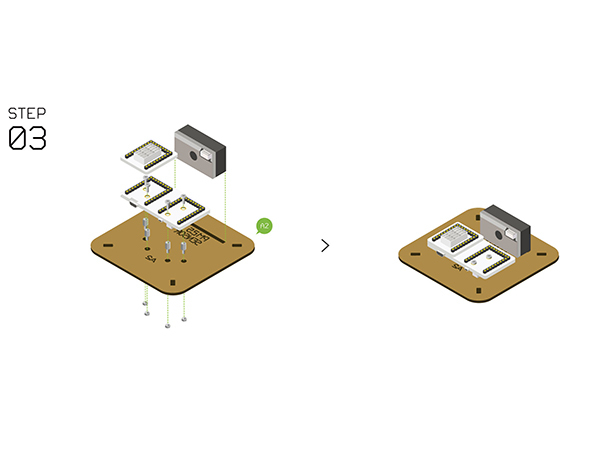 Complete the steps above, plug in a USB cable then fixate Structure-B0. Congratulations! You finished the buildup of the Weather Station. Power on the Weather Station. The Weather Station will connect to the WiFi network. This may take a minute or so. After connecting, the OLED screen will display the sensor data. If the data does not display, check the serial port in the IDE. It should display debugging information. If the Weather Station successfully connect to the WiFi network. You can now view the data on the Blynk Phone app. WiFi Weather Station successfully connected to the WiFi network. Return to your phone which is running Blynk. Open the Weather Station project. Click on Start (play icon). 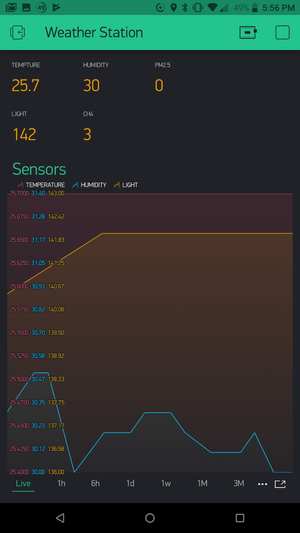 The sensor data should start streaming to the Blynk app. Please make sure the verification code is configured right. Make sure your router runs normally, the SSID and password are correct. This page was last modified on 19 December 2018, at 02:34.